It's never too early to introduce children to union negotiation and a positive spin on collective ownership, right? I'm going to assume your answer was "right," so here is one idea for a lesson plan or story time to draw out and discuss these themes with kindergartners and first-graders. 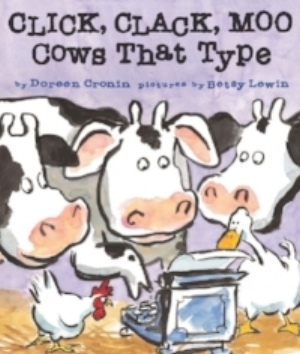 First up is that old workhorse CLICK CLACK MOO (2000, Doreen Cronin, ill. Betsy Lewin). Of course this book is about union solidarity and strikes. It's a great way to introduce those vocabulary words to kids ("Do you know what the word 'strike' means? It means that people refuse to do their jobs until they get treated better." " 'Solidarity' means they're all working together for the same goal. What if some cows decided they didn't mind being cold? The strike wouldn't work!"). If you're passing by a picket line, or Scabby the Rat (not uncommon here in NYC), it's easy enough to refer back to CLICK CLACK MOO to explain what the children are noticing. Or, if you decide to participate in a boycott, not buying certain products or patronizing certain stores, you can bring it back to CLICK CLACK MOO and draw connections between a variety of larger issues. The second title is called FARMER DUCK (1996, Martin Waddell). It's so similar to Animal Farm it almost seems intentional. The gorgeous opening spread is of a barren farm, leafless trees and grayish-brown fields. The duck has been conscripted into doing all the farm work while the human farmer lazes in bed (there's one mildly fatphobic remark, fyi). The other farm animals feel bad for their friend, and organize a nonviolent coup to eject the farmer and run the farm themselves. The final spread is of the same farm, lush and verdant. This is a great way to introduce the concept of bosses and workers, who profits from labor, and how to work together to improve your situation. You can even play the jaunty tune "Dump The Bosses" if you want a variety of media. The Stonewall Awards for 2017 are coming up in a little over a month, which means it's not quite too late to link to an article about last year's ceremony. I got to introduce my hero Cory Silverberg, and speeches by all the other winners were just incredible. And me talking about trans young adult novels! Vee at Gay YA gave me yet another platform to talk about what I don't like in books (and some of what I do like). School Library Journal published this article, where I talk about why picture books for and about trans children largely fail to live up to the rigorous standards of the form.